“Oh no! Go go go go!! Get away! Yaayy!” I wondered what the wolves thought about being cheered and jeered at by the crowds of people who had lined up along the road to watch the wolves’ attempt at obtaining elk calf victuals. Most of the onlookers were pulling for the calf. I was silently dismayed when the calf was able to repeatedly escape the ravenous jaws. I cannot but help being excited for ecology in action. 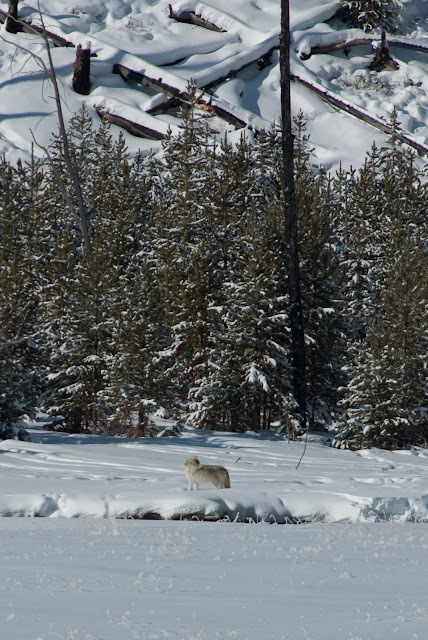 Prior to my arrival to the scene, the wolves had shunted several elk away from the main herd. The small group had taken safety in the waters of the Madison River, a place deep enough for the elk to stand but forcing the wolves to swim. 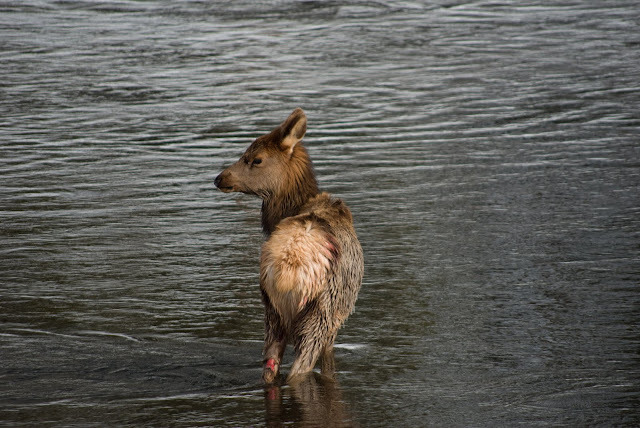 The river’s current would simply push the wolves downstream, preventing them from gaining any sort of advantage on the hapless elk. At some point, the wolves wandered away, probably to catch their breath and take a break, during which time the elk were able to get out of the water and make a run for it to the main herd. But somehow a calf was left behind, and the wolves came back for another try. 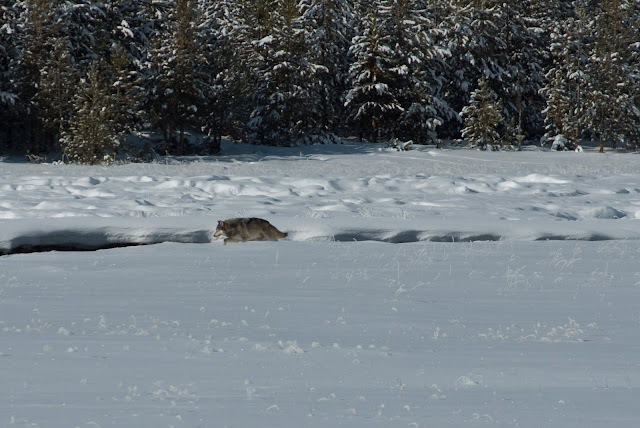 The wolves belonged to Canyon pack, with only three wolves; the same three wolves my mother, Mary Youderian, and I observed on a carcass earlier this season in Norris Geyser Basin. The tri-canid clan is a wonderful sight; the black alpha male commanding a beautiful white female and a large gray male. The energetic gray made repeated attempts at the lone calf, but the calf, even in utter terror, held her position in the deeper water. Several swimming attempts by the gray were fruitless, as the rivers current would push him away. I had found it a bit odd that the pack wasn’t working together. 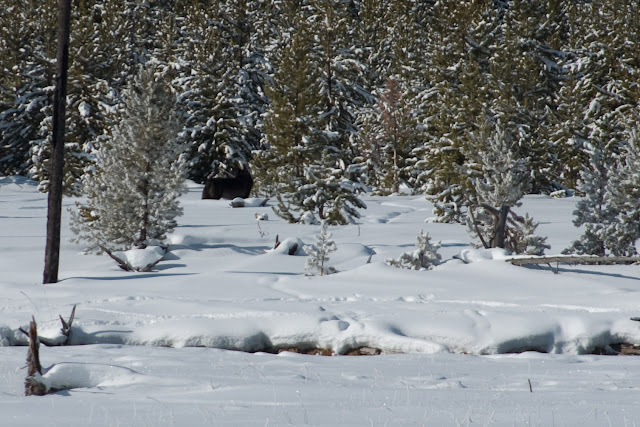 The gray was actively jumping down from the snowy bank into the water, then jumping out, and running along the bank, trying to get the calf to make a mistake. The white female helped a little, but it took her a while to get excited about it; at first she was hesitant to even put her paws in the water. The black alpha mostly just looked on. Maybe he knew the futility of trying, for the calf had the upper hand in the situation, simply because it remained in the water. Finally, all three wolves jumped into action, running along the bank, getting in and out of the water as the horrified calf swam downstream, then upstream, then downstream. The gray dropped off the bank and disappeared into the water where we could see neither him nor the elk. Seconds later, a shriek pierced the air; the calf had screamed as the gray had latched onto its leg. But the calf still got away. The wolves continued at it, until they apparently were too dog-tired. Eventually, they left the calf for good, hoofed it into the trees and bedded down, where they remained for the rest of the day. It took the calf about an hour to mentally recover, after which she finally came out of the water and headed downstream. Her left rear leg had a red gash where the wolf had chomped down. How is it that you are able to be "silently dismayed" for being unable to witness "ecology in action" while, on the other hand, you lable the injured hapless prey as "the poor little lonely, terrified, and wet calf"?? I think there is a soft-hearted human inside the researcher's green refrigerator suit.